In November 20I6 I installed the new Dynaudio M5P loudspeakers. Provisionally I mounted them on 4×4 wood blocks on top of the cement slab. Then by December my new custom isolators from AV Room service arrived. The improvement was tremendous: Bass response tightened considerably, interfering sounds got dramatically quieter — there was more “black” between the notes. When I stand between the loudspeaker and the front wall while music is playing the sound has become eerily quiet, while before it was audibly noisy up there. Here’s an objective measurement comparison: This movie compares the waterfall response in the room. Click on the movie to get it looping. In green, the old one, speakers mounted on wood blocks. In blue, the new response, with the AV Room service isolators. For the technically inclined, here’s a detailed description of the measurement procedure and an analysis of the waterfall display. I’m convinced: Mount your speakers on calibrated isolators and get an improved, clearer, cleaner response. I use a calibrated Josephson C550 measurement microphone, pointed upwards. I locate the microphone precisely at the listening position, ear height, which is also tweeter height. I use a plumb bob to locate the microphone consistently above a marked spot on the floor. Microphone height is measured by comparing the microphone diaphragm with the height of my ear canal when seated. Distance and angle is confirmed by measuring the distance between the microphone and the left and right tweeter in samples (at 48 kHz) comparing the arrival of signal from microphone to a direct loopback connection. It’s about 10 feet. This plumb bob method is so repeatable that typically the microphone ends up no more than 1 sample off (1/4 inch) compared to previous measurements. If necessary, I relocate the microphone minutely until it is precisely centered and always with the same time delay in milliseconds between each loudspeaker and the microphone. All of these parameters (height, distance, etc.) were matched to 1 sample or better distance (about 1/4 inch) between the November measurement with the speakers on wood blocks and the December measurement with the speakers on the isolators. The isolators have been calibrated to an 8 Hz cutoff frequency based on the 300 pound weight of the loudspeakers and with one isolator in each of four corners dividing the weight four ways. In other words, everything (every vibration) above 8 Hz is isolated from the floor. Using Acourate software from audiovero.com, I run a logsweep at 48 kHz from 10 Hz to 24 kHz. Amplitude is about 80 dB SPL. This is an uncorrected measurement, loudspeaker linearization has NOT been performed for this logsweep. There is a 60 Hz linear phase crossover implemented in Acourate between the Dynaudios and the JL subwoofers. The JL subwoofers are sitting on their own integrated soft feet which are placed on top of the carpet and mat. The subs were NOT altered at all for each of the two measurements. The only thing that was changed was the main Dynaudio speakers mounted on either wood blocks which are sitting on the concrete floor (November) or isolators sitting on the same concrete floor (December). Acourate converts the sweep to a 2448 impulse (wav) file using deconvolution. I export the 2448 impulse file to Room EQ Wizard for waterfall analysis. Let’s take a look at the waterfall. When the movie is running, it’s switching between green (left front speaker on woodblocks, November 2016) and blue (left front speaker on isolators, December 2016). At the top of the waterfall is the first slice, at 0 ms. At the bottom, the 51st slice is at 300 ms, so there is 6 ms. between each slice. The waterfall measurement stops at 300 ms. The further the slices are physically vertically from one another, the faster the decay. 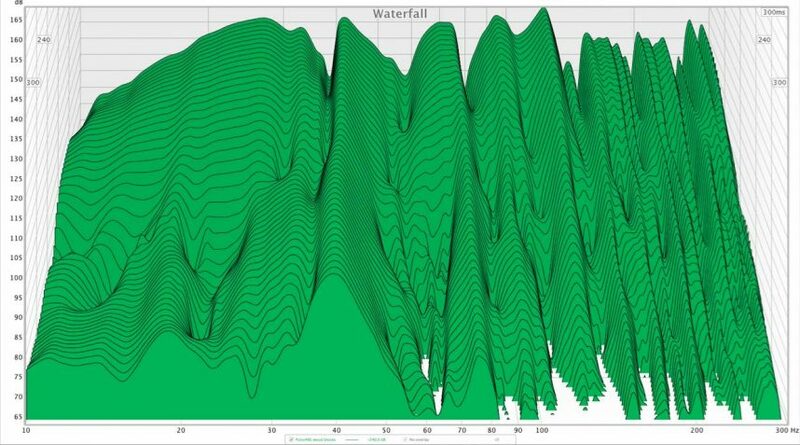 Let’s start comparing the two waterfall plots by looking around 300 Hz at the right and top of the waterfall plot. Notice that the two peaks around 280 and 300 Hz are about the same amplitude, bandwidth and decay speed for both plots. I feel this congruency between the November and December plots is a clear indicator that the microphone has not moved between November and December, the speakers are at the same height and all measurement parameters and amplitudes are the same. Similarly, at the left side of each colored plot, between 10 Hz and about 27 Hz, the first 120 ms. of decay are very similar. I would expect to see congruency in the low bass because that’s the territory of the subwoofers, which were not altered between November and December. Crossover is 60 Hz. Looking higher in frequency, by about 30 Hz, the two plots begin to differ significantly. For example, around 42 Hz, there is a sharp, high Q peak that distinctly decays for 300 ms. with the wood blocks (green), but with the isolators, the bandwidth of this resonance has widened considerably… it’s much gentler and therefore far less of an audible problem. If you look slightly to the left of that peak in the blue color (isolators) you’ll see its much more subtle remnant begins circa 80 ms. Next notice how the distance between amplitude peaks and crests has greatly reduced with the isolators. For example, the distance between peak/dip/peak at 42 Hz, 58 Hz and 60 Hz is much less with the isolators. The result is a more gentle, less sharp resonance with the isolators, much smoother frequency response and far less negative impact on the sound quality. The trough circa 80 Hz has also been greatly filled in with the isolators. The peaks circa 95 and 120 have also been greatly reduced with the isolators and once again the bandwidth of the resonances has become more gentle with the isolators. I’ll leave it to you to find more differences. Not every resonance has improved, one has gotten a hair worse, but the vast majority have improved. Some readers have said that my results are not translatable. Certainly not everyone has 300 pound, 8 foot tall loudspeakers. But I am comfortable to assert that there would be improvements with the isolators with even smaller loudspeakers. A friend has a custom-built pair of 80 pound speakers on stands. These speakers are good to below about 40 Hz. He has recently isolated the speakers with a model of the EVP isolators and reports very positive results. It’s not as easy to make apples-to-apples comparative measurements with his speakers because the height would change, but perhaps we could make some wood blocks that are the identical height as the isolators and try.